But is it 'very hungry'? No, the above picture is not of some kind of weird stitching or plaster; it is in fact a robot. The natural-scale caterpillar robot has been developed by the University of Warsaw using liquid crystal elastomer, a smart-material which can change shape and move under different lighting conditions. Taking commands from a special laser beam, the robot can crawl along flat surfaces, climb up slopes, and even carry things. The idea came from copying an animal in nature that doesn't use a tough exoskeleton or rigid legs. 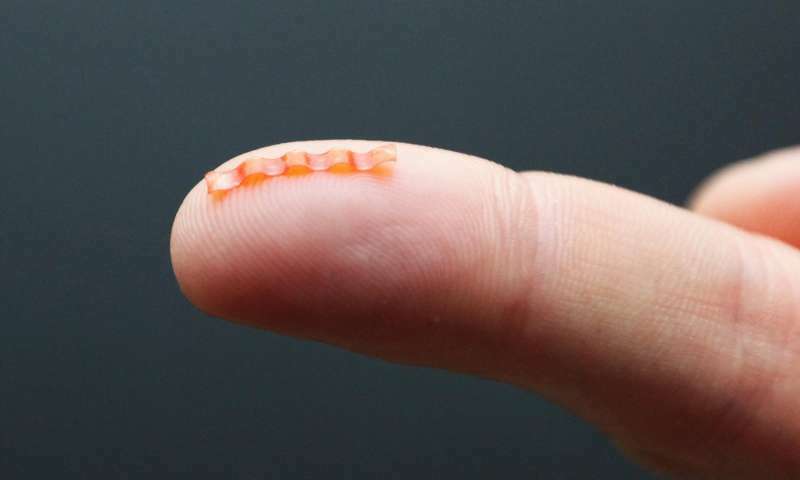 By copying the caterpillar they were able to create something flexible and soft, and using liquid crystal elastomers mean the robot can squeeze itself into tight spaces - it is, after all, only 15mm long! Interesting stuff, but we don't fancy the caterpillar's chances in Robot Wars.